Japanese 420J2 stainless steel is very sharp,durable and strong.The hardness is nearly 57 HRC. Hand made by the craftsman,Proving a comfortable cutting feeling. 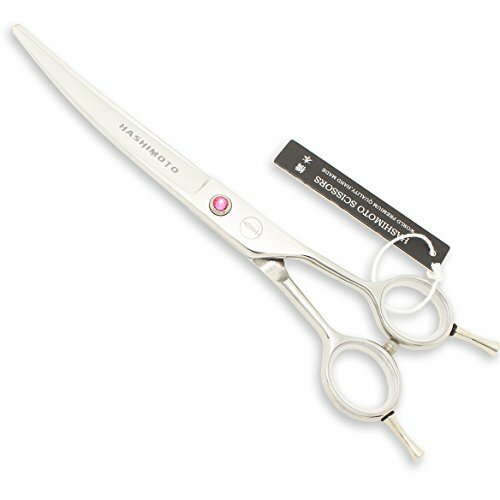 As symmetrical handle design,this scissors can be used for both up-curved and down- curved.It also has double removable finger rests. More easier to trim your pet at home for beginners,Pink gem screw can be adjusted by a complimentary key. 【Steel】-- Japanese 420J2 stainless steel is very sharp,durable and strong. 【Feeling】-- Hand made by the craftsman,Proving a comfortable cutting feeling. 【Design】-- As the symmetrical handle design,this scissors can be used for both up-curved and down- curved.It also has double removable finger rests. 【User Friendly】-- More easier to trim your pet at home for beginners,Pink gem screw can be adjusted by a complimentary key. If you have any questions about this product by HASHIMOTO, contact us by completing and submitting the form below. If you are looking for a specif part number, please include it with your message.